From British Columbia to Montreal, the low Canadian dollar is proving a boon to the tourism sector. 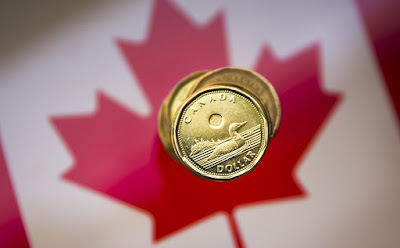 Dragged down by cheap oil and an international slump in commodity prices, the dollar is trading at around 70 cents against the greenback and enticing Americans to travel north of the border. "We're getting more reservations at the last minute from Americans planning trips for the weekend," says Eve Pare, head of the Hotel Association of Greater Montreal. Montreal-area hotels in December made more than $40 million, up more than nine per cent from a year earlier, Pare noted. The city's tourism bureau said last summer's season — between June and August — saw a 10 per cent increase year over year in the number of American tourists crossing the border into Quebec. For Katie, 20, a McGill University student from New York State, the low Canadian dollar means her tuition is "basically nothing." On a mini-vacation with her friend Jack, 21, also from New York, the two said they were spending more than they regularly would on eating out. "I've been taking advantage already," says Jack, standing on a corner in Old Montreal. "We're going out to nicer dinners than normally because it means you can take off 40 per cent from the bill." Around the corner at the Jacques Cartier Square, Adriana Carvalho, 43, from Brazil, said she and her partner had been planning on visiting the United States but changed their minds at the last minute to take advantage of the dollar. The Brazilian real is trading at 24 cents US while it's at about 34 cents in Canada. But Carvalho said the dollar wasn't the only reason they made the trip to Montreal. "You guys have things here we can't get in the U.S. like furs," she said. "And we love skiing." Alexander Kiorpelidis, who owns a Montreal souvenir shop, estimates he's had about a 15 per cent increase in the number of American tourists over the past six months, even though they aren't necessarily buying more of his wares. "(This) year we're expecting a big jump he said," referring to the upcoming high tourist season in July and August. "I would like to see 25 per cent increase in sales," he said. Ellen Graham, 25, walking down the old district's cobblestone streets, said she is about to marry her fiance, Lance Lynch, 30, who travelled from Florida to be interviewed by U.S. immigration officials. "I came up to meet her at the consulate and we made a vacation out of it," he said. "Everything is virtually 30 per cent off here, which is huge." In British Columbia, a spokeswoman for Tourism Whistler, which tracks overnight room stays at the cluster of resorts north of Vancouver, said November and December 2015 were the busiest for those months on record and that the low Canadian dollar has been a "huge incentive" for American visitors.